Got student loans? We’ve got you covered with our Student Loan Smarts blog series. Our expert tips and hacks will help you save money, pay off loans sooner and stress less about student loan debt. Read the other posts in the series here—and get all the info you need to make intelligent decisions about your student loans. And while you’re at it, check out SoFi’s new Student Loan Debt Navigator tool to assess your student loan repayment options. One of the biggest student loan myths out there is that borrowers can’t consolidate federal student loans and private student loans into one loan. It’s understandable why people think that, since this wasn’t an option for many years. But now that the choice is available, it’s important to understand whether federal and private loan consolidation is right for you – especially when there’s the potential for significant cost savings on the line. Can I Consolidate Federal and Private Student Loans? It is possible to combine private and federal student loans by refinancing them with a private lender. While it’s not possible to use the federal Direct loan consolidation program to combine your federal student loans with private loans, it is possible to combine private and federal student loans by refinancing them with a private lender. Through this process, you actually apply for a new loan (which is used to pay off your original loans) and you’re given a new—ideally lower—interest rate. Why would you want to do this? In addition to the advantages of loan consolidation (like having one, simplified monthly payment), refinancing student loans at a lower interest rate can mean big benefits, like lowering monthly payments or reducing the time it takes to pay off your debt, and cutting down on the total interest you pay over time. Some people assume that federal loans always offer the best rates, but this just isn’t true. 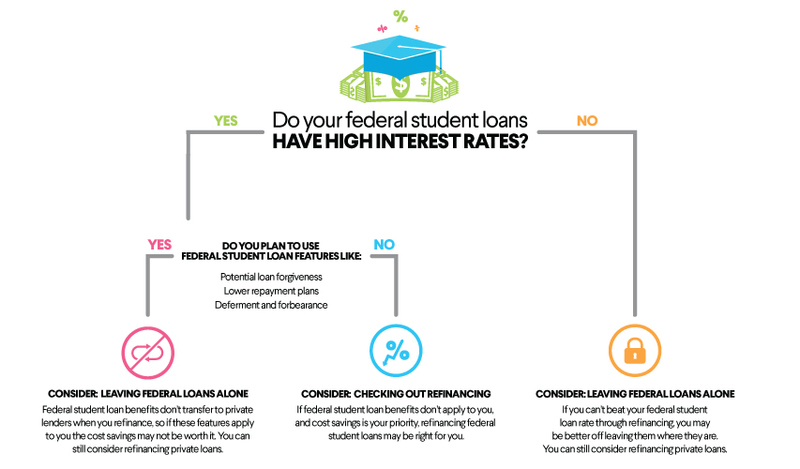 Depending on loan type and disbursement date, your federal student loan rate could range from about 3% to 8%. With prevailing interest rates at historic lows, some private lenders offer rates that are significantly better than a high-rate federal loan. This is particularly true for grad school borrowers who use unsubsidized Direct loans and Graduate PLUS loans to finance their education. Some federal student loans offer benefits and protections that do not transfer to private lenders. This is often the reason that people cite when they say you shouldn’t combine federal and private loans. But before you dismiss the idea of refinancing, you should first take a look to see if any of these benefits apply to you. For example, under the Public Service Loan Forgiveness Program (PSLFP), your Direct Loan balance may be eligible for forgiveness after 120 payments if you’ve worked in the public sector that entire time. Similarly, the Teacher Loan Forgiveness Program is available for teachers who work in schools that serve low-income families full-time for five consecutive years. These are clearly great programs for people who choose careers in public service or education, but if that’s not you, they won’t do you any good. There are also a number of federal loan repayment plans that can ease the burden for borrowers facing tough economic times. For example, the government’s Pay As You Earn (PAYE) and Income-Based Repayment (IBR) programs allow borrowers to make reduced monthly payments based on financial hardship. But if your income is over a certain threshold, you won’t benefit from these programs. And if you do qualify, but you’re at the high end of the spectrum, your slightly lowered payments may come at a disproportionate price in the form of accumulating interest. Recommended: Looking for more guidance on student debt? Explore our student loan help center! Some private lenders offer their own benefits and protections. It’s important to note that some private lenders offer their own benefits and protections. At SoFi, for example, if you lose your job, we’ll not only pause your payments, we’ll help you find a new one. Combining federal student loans and private loans through the refinancing process won’t make sense for every borrower, but it provides great benefits for some. Now that you know it’s an option and you understand how it works, you can better assess whether it’s right for you. *Click here to see student loan refinance examples that depict APR, monthly payment and total finance charges. 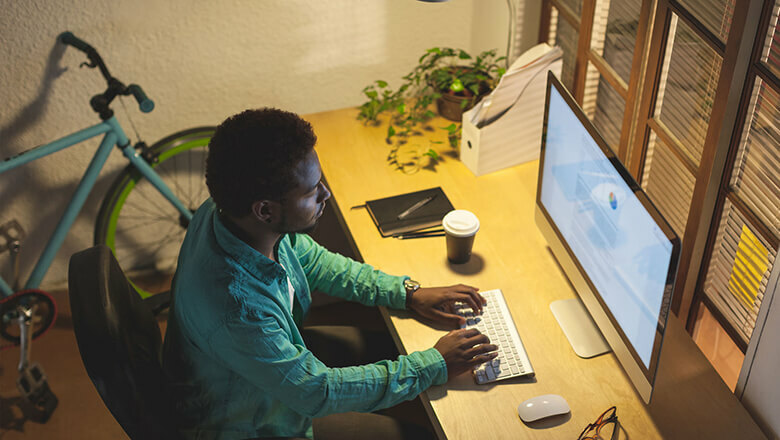 See how student loan refinancing with SoFi can help you save money.